As an avid shopper, I tend to buy clothes, jewelry, and accessories from both big-name stores as well as smaller boutiques. But as a whole, some of my most coveted items in my closet are from local boutiques who carry designers and fashions that you would never be able to find at stores like Bloomingdale’s. But while I can peruse the boutiques of Chicago, I can’t access the smaller boutiques in New York, LA, San Francisco and other cities without visiting those areas. Until now. 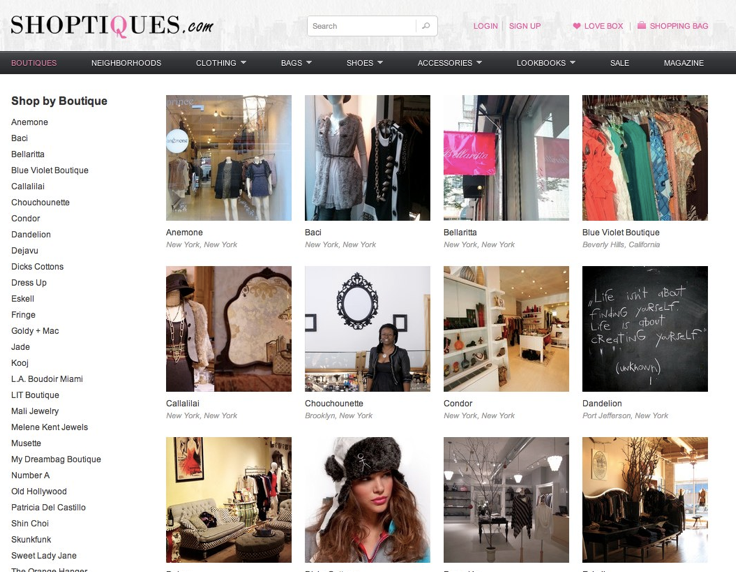 Enter Y Combinator startup Shoptiques, which aggregates inventory from local fashion boutiques and puts it online. The company is launching today, and announcing an undisclosed amount of funding from Andreessen Horowitz, Greylock Partners, Benchmark Capital, SV Angel, Y Combinator and other angels. At a high level, Shoptiques vets and works with local boutiques in cities across the U.S. to integrate their inventory onto the site, and then sell these items to visitors. Here’s how it works: Shoptiques will partner with a boutique and have one of its photographers (the startup works with a network of freelance photographers) to take high quality photos of the items and then upload them to Shoptiques, along with descriptions and prices. Users can now browse collections from boutiques across the country that they would never otherwise have seen or known about. In order to qualify to be listed on the site, the boutique has to offer women’s clothes, jewelry, handbags or more that cannot be found at Bloomingdale’s, Neiman Marcus or another larger store. As founder Olga Vidisheva tell us, the main qualification is to carry items that no one else has. She adds that around 50 percent of boutiques that apply to be on Shoptiques are rejected for this reason. The site launches with inventory from over 25 boutiques, from Los Angeles, Miami, New York and Chicago. In terms of how Shoptiques finds these local boutiques, Vidisheva says the site has partnered with magazines like Elle and others to find interesting stores and has also received many leads via word of mouth recommendations. Currently, boutiques are organized by location, and neighborhood on the site, and the price point on items ranges from $50 to $300. You can also shop by category (bags, shoes, tops etc.). If a customer chooses to purchase an item on the site, Shoptiques will immediately send the boutique an email with the order, and a printable FedEx label with the customer’s address. The startup handles all of the payment processing, and takes an undisclosed fee from each transaction. The startup has been experimenting with curation as well. Shoptiques is actually putting together looks, based on current fashion trends, from items sold at various stores across the country to help customers pair clothing and accessories. Additionally, the startup has written features on boutique owners, favorite items and more. As Vidisheva explains, many of these local boutiques don’t have an online presence and find the whole process challenging. Shoptiques takes the hassle out of creating an independent store online, setting up inventory and payments infrastructure and also helps market these stores as well. It’s similar to what Etsy has done for artisans and craftspeople. Eventually, Shoptiques wants to expand internationally, and add many more boutiques so that it becomes a full-fledged marketplace. The concept is certainly appealing, especially to someone like myself, who likes to find and wear unique items that perhaps aren’t found at my local Saks Fifth Avenue.